Wavelength creates Color objects given the wavelength or the frequency of the light rather than the usual RGB or HSB. instead of: Color c = new Color(255, 0, 0); use the frequency in nanometers, and gamma 0.0. .. 1.0. (gamma is intensity/brightness.) Color c = Wavelength.wvColor( 400.0f, 0.80f ); The visible range of the spectrum is 380..780 nanometers. Smaller is bluer. 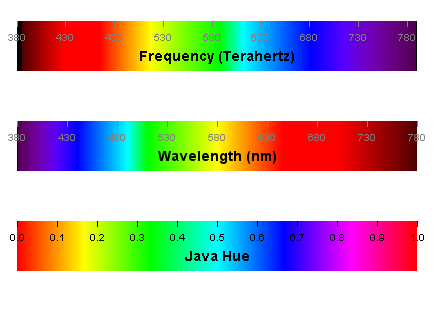 Use frequency in Terahertz with fColor. Wavelength does not do much on its own. Wavelength is intended to be incorporated into your own programs. You might use it to draw a realistic rainbow, or to write educational Applets about the light spectrum. Qweas is providing links to Wavelength 1.3 as a courtesy, and makes no representations regarding Wavelength or any other applications or any information related thereto. Any questions, complaints or claims regarding this application Wavelength 1.3 must be directed to the appropriate software vendor. You may click the publisher link of Wavelength on the top of this page to get more details about the vendor.